In the very first chapter of the Bible, God instructs the representatives of the human race, Adam and Eve, to “fill the earth and subdue it” (Gen. 1:28). Over the years this verse has caused much confusion and controversy inside and outside of Christianity. What does this instruction mean within the context not only of the Book of Genesis, but the entire Bible or counsel of scripture? How did God intend for people to subdue the earth and what should it look like? The overall purpose of this article is to address these fundamental questions. To address the first question, three general principles of a Christian environmental ethic found in the Bible are discussed. The second question, which is one of putting principles into practice, is addressed by discussing how the general ethical principles are carried out through Christian environmental stewardship. Because we all live on the same planet and are ultimately dependent on the natural fruits of the earth for life-support, everyone has a stake in how elements of nature and natural systems are used and managed. When a specific natural resource or environmental issue or problem arises, individuals and groups often disagree on the appropriate course of action to resolve the issue or problem. At the core of these disagreements are different values and beliefs related to nature itself, and the use and management of nature by people. Scholars in the humanities, social sciences and physical and biological sciences have emphasized that environmental issues and problems are fundamentally interrelated with ethical issues and problems. Consequently, we are hearing more voices saying that in order to solve environmental issues and problems, people need to develop and follow an appropriate “moral basis” for dealing with the environment. This recognizes a basic tenant of human behavior taught in the Bible: true change starts from within a person’s heart, mind and spirit and works outward as reflected by attitudes and actions. In all areas of our lives, the substance of our inner faith determines the living out or practice of our faith. The system of values and beliefs that influence how a person thinks and acts is known as that person’s ethical system or ethics. In what follows below in this section, three general principles of a Christian environmental ethic are discussed. These three principles are: (1) God created and therefore values all of his works of creation (Principle of Creation Value); (2) God created and sustains all elements and systems in his creation within particular orders to meet certain ongoing purposes (Principle of Sustained Order and Purpose); and (3) Everything in the created world and universe is subject to corruption by sin and ultimate redemption through Jesus Christ (Principle of Universal Corruption and Redemption). The three general principles of a Christian environmental ethic are consistent with a careful study of God’s Word found in the Holy Bible as illuminated by a number of historical and recent authors. In this article, God’s creation refers to natural creation described in Genesis 1:1-25 composed of the earth, sky and natural elements found therein such as rocks, minerals, soil, water, air, vegetation and fish and wildlife. Natural creation in this article is also referred to in short as “nature” or “the environment.” The terms “nature” and “the environment” are used interchangeably. Plato’s philosophy influenced the Gnostic view of the physical world that arose within the first-century Christian church. Followers of Gnosticism taught that the spiritual world contains all that is good, and that everything in the physical or material world is bad. Thus, under Gnosticism, nature would have a negative value and is something that should be disregarded in a person’s life. Christians in the modern church who say that “the environment really doesn’t matter because it’s part of the physical world” are carrying on the heritage of Plato and the Gnostics. This position, which has a very low view of nature’s value, is not supported by the Scriptures. As pointed out by Schaeffer, the greatest testimony to the lasting value and importance of the physical world (the environment) is that Jesus Christ’s physical body was resurrected from the dead and exists today in the unseen spiritual world. In the new heaven and earth that God will someday create, Scripture teaches that in addition to Christians being given new, resurrected bodies, nature will also be renewed. As discussed in more detail later in this article, both people and nature will therefore have existence and value in eternity. The other extreme position on the value and importance of the physical world and nature that Christians should not fall into is one that improperly elevates the status of nature to being equal to or even above people. The “equality between people and nature” viewpoint is considered first. In modern times, certain secular environmental ethics or philosophies such as “deep ecology” teach that people and nature have equal status and value in the world. Such viewpoints on the parity between people and nature can enter into the church as erroneous teaching. Scripture teaches that although God values nature, he places a special higher value on people who he “crowned with glory and honor” as the climax of his creation (Gen. 1:26-30; Ps. 8:5-8). This passage refers to people who knew or at least knew of God but elevated nature to be objects or idols of worship. The worship of anything in nature violates the Second Commandment in which God states: “You shall not make for yourself an idol in the form of anything in heaven above or on the earth beneath or in the waters below. You shall not bow down to them or worship them” (Exod. 20:4-5). 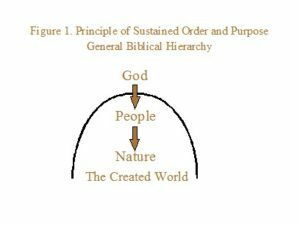 The Principle of Sustained Order and Purpose implies that God originally created all elements of the environment to fit and function together in an orderly fashion within interrelated systems to meet certain ongoing purposes. God’s direct involvement in natural systems did not end after the original creation period described in Genesis 1. The triune God continues to hold together or sustain the functioning of nature, accomplishing his intended order and purpose for all nonliving and living elements of the environment and environmental systems. 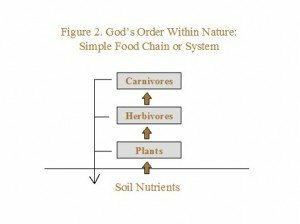 What are the various purposes of nature or the environment according to the Bible? One of the reasons God created and continues to sustain nature, as discussed above under the Principle of Creation Value, is for God himself to love and enjoy. Another purpose is to help meet people’s need for things such as food and shelter (Gen. 2:15; 9:3). A third major purpose of nature is to glorify and reveal God to people everywhere (Ps. 19:1-4; Rom. 1:18-20). For example, it says in the Psalms: “The heavens declare the glory of God; the skies proclaim the work of his hands. Day after day they pour forth speech; night after night they display knowledge. There is no speech or language where their voice is not heard. Their voice goes out into all the earth, their words to the ends of the world” (Psalm 19:14). Genesis 1:28 establishes that in God’s basic ordering of creation, people have dominion over nature. However, Genesis 1:28 also clearly states that people are creations of God. As creations of God, people are under the authority or dominion of God. Thus, from the perspective of God’s authority and control, people and nature are in the same class or order—all of creation including people must submit to God’s plans and ways. 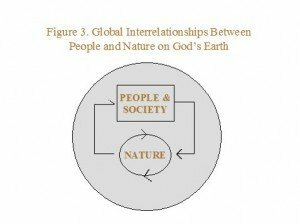 The basic Biblical relationships and ordering between God, people and nature are illustrated in Figure 1. A similar illustration is provided and discussed by Schaeffer. In Figure 1, it is first shown that there is a fundamental separation between God and his creation including people. God is above people and nature, and both people and the elements of the environment such as plants and animals must interact and live together within the same created world governed by God’s ways and plans. Thus, people share a common heritage and bond with plants, animals and other elements of the environment as fellow creations of God. People, like plants and animals, must also cope with living in a physical world and universe created and controlled by God. The diagram also illustrates that within the physical world and universe, people are above nature. People are above nature by the grace and will of God only—not by our own power and ingenuity. God created people in his image to exercise Godly dominion over nature. Godly dominion over nature, as discussed in more detail later in this article, means that people act as stewards or caretakers of nature who are ultimately responsible to God for their use and management of the environment. In addition to the major large-scale relationships or orders between God, people and nature illustrated in Figure 1, God created and sustains elements of nature within particular orders to meet deliberate purposes. 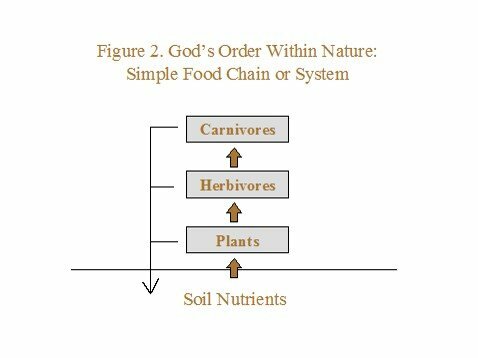 The simple food chain system shown in Figure 2 illustrates how living and nonliving elements of nature in the environment fit and function together to provide life-support for each other. As illustrated in Figure 2, living plants take nutrients from the soil. Herbivores such as rabbits or deer eat plants for food. Carnivores such as mountain lions eat other animals for food. When plants and animals die, microorganisms in the environment decompose the plant and animal body material into basic chemicals that go back into the soil. These chemicals are then taken up by plants for nutrients completing the cycling of life-supporting chemicals through the environment. People are also dependent on the food chain and chemical cycling systems illustrated in Figure 2. The linkages and interrelationships between people and elements of the environment and environmental systems are illustrated at a broader scale in Figure 3. 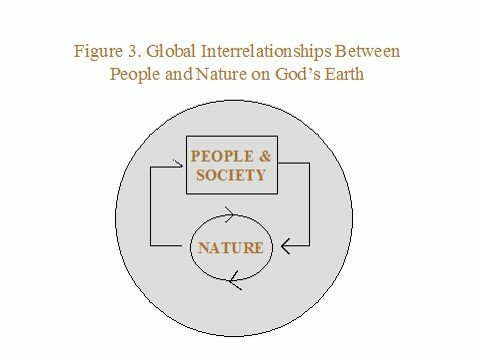 Figure 3 illustrates the planet earth home God has provided for all of us, and the global interrelationships between people and nature or the environment. The scientific study of natural life-support systems falls under the realm of ecology. The word ecology is derived from the Greek root words, “eco” meaning “house” and “logy” meaning “study.” The word ecology can therefore be literally interpreted to mean “house study” or the “study of the house.” The “house” being referred to here is the planet earth and its natural systems. Before describing how the earth’s natural systems provide life-support, consider the artificial life-support systems that people build into the various dwellings we call home at a small scale. The actual physical dwellings in which we live were constructed by people with certain life-support systems in mind. These artificial life-support systems include: air circulation systems to regulate oxygen (O2) and carbon dioxide (CO2) levels so that indoor air is healthy to breathe; water systems to provide safe and secure drinking water supplies; heating and cooling systems to regulate indoor temperatures at healthy levels; and waste disposal systems that help to prevent illness by safely and regularly removing potential germ-producing human wastes and garbage. The planet earth and different ecosystems such as forests, deserts, oceans, lakes and rivers were created by God with natural life-support systems in his mind and design. God built several major chemical cycles into our planet earth home. Each of these cycles helps to provide all that is needed to support life on earth. For example, the carbon and oxygen cycle helps to provide breathable air and regulate global temperatures at livable levels. The hydrologic cycle helps to provide water to drink and for a multitude of other purposes. The different chemical cycles also contribute to the provision of mineral resources such as coal, oil and natural gas that we use as fuel for transportation, electricity, and heating. These cycles also support renewable resources such as trees and fish and wildlife. We use trees for consumptive uses such as lumber, and to support nonconsumptive uses such as recreation and aesthetic enjoyment. We use fish and wildlife for consumptive uses such as harvesting ocean fish for food, and hunting of wildlife on public and private lands. We also use fish and wildlife for nonconsumptive recreational uses and aesthetic enjoyment such as wildlife observation and photography. When people use elements of the environment for commercial production and consumption, and even recreational and aesthetic enjoyment, some level of waste by-products enter the environment. Smoke stacks into the air and effluent discharge pipes into rivers are obvious evidence of these waste by-products. When people use a forest or park for recreation, waste by-products are emitted into the air from automobiles, recreational vehicles (RVs), all-terrain vehicles (ATVs) and motorboats. Solid wastes in the form of litter are also often left behind. God has built waste assimilation and treatment capabilities into environmental systems. For example, scientists have documented the natural ability of wetlands to filter chemicals out of water that are potentially harmful to human health. However, excessive waste by-product disposal into a particular environmental system such as a wetland area may threaten the continued ability of that environmental system to assimilate and treat wastes. The God-given role of people as caretakers or managers of elements of the environment and environmental systems is illustrated through several linkages. People manage the environment, for example, by cultivating the land to grow and harvest crops for food through agriculture, and to grow and harvest trees for wood products through forestry. People manage lakes and rivers for producing electricity, providing drinking water and to support many types of recreational activities such as boating and swimming. People may also be involved in managing entire ecosystems to provide fish and wildlife habitat and other broad environmental services such as protection of regional air and water quality, or even regulation of global climate. People also manage nature through waste and pollution management and policy. For example, people design and build waste treatment facilities to filter harmful materials out of human sewage wastewater before the water is discharged into the environment. People also design and implement “best management practices” for reducing waste runoff from construction sites, farms, and forest and mining operations. Other people are trained and hired to develop and enforce policies and laws for regulating the discharge or emissions of waste by-products into the environment from a variety of sources including point sources (e.g., manufacturing plants) and non-point sources (e.g., automobiles). This section discussing the Principle of Sustained Order and Purpose has emphasized that God created people and nature with order and purpose. In God’s ordering, people are over nature—meaning that people may take from nature to meet their needs. However, God also expects people to give back to nature since one of God’s intended purposes for people is to act as responsible caretakers of nature. The Principle of Universal Corruption and Redemption has familiar implications with respect to the relationship between men and women created in God’s image by God their Creator. The Scriptures are clear that all men and women have sinned and fall short of God’s expectations for a righteous life (Rom. 2:23). Thus, we are all in need of forgiveness and saving faith through a personal relationship with Jesus Christ (1 John 1:8-9). The Scriptures also teach that all of creation has been corrupted by sin (Rom. 8:20–22). The effects of this universal corruption include not just separation of people from God, but also separation of people from themselves, each other, and nature. The separation of people from nature as a result of sin entering the world at the time of the Fall of Mankind taught in the Bible (Genesis, chapter 3) is of particular interest to the topic of this article. Nature provides beneficial services to people, but since the Fall, nature can also be the source of physical harm to people—the physical harm to people caused by tornadoes, hurricanes and tsumanis are graphic examples. The Fall also has resulted in loss of overall harmony between people and nature (Genesis 3:17-19). Prior to the Fall, Genesis chapters 1 and 2 present a picture of close harmony between God, people and nature. The introduction of sin into the world and its corrupting effects on all of God’s created works shattered this harmony. For people, forgiveness and saving faith through Jesus Christ assures personal redemption of the believer before God, and restoration of the believer’s relationship and fellowship with God. Scripture teaches that God will also redeem nature and restore the relationship and harmony between God, people and nature in the eternal world (Isa. 11). God’s plan for redeeming nature is reflected in the creation covenant. This passage teaches that the physical environment is not destined for eternal destruction when the world we now live in ends when Jesus Christ returns. Rather, in the new heaven and earth, God will give believers new physical bodies and he will also provide a new physical beginning and form for the natural world and universe (Rom. 8:20-23; 2 Pet. 3:12-13; Rev. 21:1). In the new heaven and earth, nature will be restored to its pre-Fall magnificence and perfection. In this new Creation of God, both people and nature will be freed from the sufferings caused by the imperfections of the world we live in today, including death and decay. People and nature will also no longer battle against each other as so often is the case in our current physical environment. The pre-Fall harmony between people and nature will be restored (Isaiah 11). Then God said to Noah and to his sons with him: “I now establish my covenant with you and with your descendants after you and with every living creature that was with you—the birds, the livestock and all the wild animals, all those that came out of the ark with you—every living creature on earth. I establish my covenant with you: Never again will all life be cut off by the waters of a flood; never again will there be a flood to destroy the earth.” (Gen. 9:8-11). The beautiful natural rainbow is God’s sign and reminder of his covenant with Noah not to destroy life on earth again with a great flood. This covenant clearly includes plants and animals and every “living creature on earth” (Gen. 9:12-16). The creation covenant referred to in Romans 8 can be thought of as an extension of God’s covenant with Noah that includes a promise to protect and sustain both people and nature. God’s concern for protecting and sustaining all living creatures was illustrated by Jesus Christ who when speaking about sparrows said that . . . “not one of them (sparrows) will fall to the ground apart from the will of your Father (God)” (Matt. 10:29). Providing for the continued and restored existence of nature in the new heaven and earth is consistent with what the Bible teaches about God’s love and concern for all of his large and small works of creation. The three general principles of a Christian environmental ethic have practical implications for the role of people as caretakers or managers of the environment. The Bible teaches that as caretakers or managers of the environment, people are to practice good stewardship. The word “steward” and “stewardship” is used throughout the Old and New Testaments of the Bible (Gen. 15:2; 44:1; 1 Chron. 28:1; Matt. 20:8; 1 Cor. 4:2; Luke 12:42; 16:1-2). The word used for steward in the Bible can also be interpreted as manager or servant. When the word for steward (manager, servant) is used in the Bible, it refers to a person who is put in charge of taking care of something that does not belong to him or her. This meaning is consistent with the Webster’s Dictionary definition of a steward as “one employed in a large household or estate to manage domestic concerns.” As stewards of nature, people have been appointed by God to manage the “domestic environmental concerns” of our planet earth home. According to the Bible, general characteristics and responsibilities of a steward include being faithful, wise and responsible. The steward should be concerned with meeting daily needs and is not to abuse or waste what he or she has been put in charge of managing. The steward is to maintain self-control (not overindulging), be a “problem-solver,” and follow the household or estate owner’s wishes and instructions with respect to use and management of what has been entrusted to his or her care (Luke 12:42-46; 16:1-9). How are stewards held accountable according to the Bible? Proper management actions are rewarded with “true riches” (spiritual riches). Improper actions are punished (something is taken away). Stewards over more are held more accountable, especially if they do wrong when they know better (Luke 12:47-48; 16:10-12). Under the Principle of Creation Value, all of God’s creations are important and valuable to God. People hold a special particular value to God as living beings created in his image (Gen. 1:26-30). Part of God’s provision for the well-being of people is the use of plants, animals, minerals and other elements of the environment for meeting our material needs. These uses, for example, include farming the land to meet food and fiber needs and harvesting trees from forests to meet wood product needs. When using elements of nature for human benefit, the Christian environmental steward keeps in mind that all of creation ultimately belongs to God and is valuable to God independent of human use. This knowledge, when put into practice, means that the Christian environmental steward respects and even loves nature out of respect and love for its creator, the triune God—Father, Son and Holy Spirit (John 14:15-17). Godly respect and love for elements of the environment leads the Christian environmental steward to be a responsible caretaker of nature who does not abuse or misuse what God in his grace has given us to use and enjoy. The Christian steward or manager of a farm, forest, park or natural area, for example, would not deliberately kill plants and animals under his or her care without good reason. Although the Christian environmental steward demonstrates Godly love and care for nature, he or she does not worship nature, only God who is its creator. Some specific instructions pertaining to managing the environment are given in Genesis 2: “The Lord God took the man and put him in the Garden of Eden to work it and take care of it”(Genesis 2:15). The phrase, “to work it” means “to till it” or “to cultivate it”; the general meaning is to use productively. The phrase to “take care of it” means “to keep,” “to guard”, “to exercise great care over.” The intent of “keeping, guarding, caring over” is to sustain the function for which the element of the environment or environmental system being cared for was originally designed. Sustaining the original God-designed functions of the environment and environmental systems is a very important objective from theological, ethical and practical (e.g. economic) standpoints. In sum, the “good steward” according to the Bible will manage nature in a wise, self-controlled, and nonwasteful manner, always taking care to sustain the original functions of elements of the environment and environmental systems. The “poor steward,” in contrast, lacks self-control, is wasteful and irresponsible, and cannot be trusted to take proper care of what he or she has been put in charge of managing. The “poor steward” allows the original functions of elements of the environment and environmental systems to be degraded or ruined. In the “natural economy” of God’s creation, human use and management of the environment and environmental systems can have positive or negative consequences. Negative consequences of poor use and management can be illustrated by thinking about the end results of not properly maintaining the life-support systems built into a house or apartment building. The most serious consequence of this poor management is that the health and well-being of the dwelling’s occupants would likely suffer. In extreme cases, such as when improper use or management of heating equipment allows CO2 in the indoor air to build up to unhealthy levels, the death of the dwelling’s occupants may result. If we misuse and mismanage nature, the ability of nature to support provision of goods and services of consumptive or nonconsumptive value to people may be significantly reduced. In extreme cases, essential life-support systems may be degraded to the point that plant, animal and human health and life are seriously threatened. However, if we use and manage nature properly as God expects, the environment and environmental systems can continue to provide essential life-support and various goods and services of value to people. Unfortunately, the poor management or stewardship model often describes how men and women of the world improperly exercise their dominion over nature. An example of poor stewardship from agriculture is farming a tract of land until the soil is totally “burned out”and incapable of further production. An example from forestry is over-harvesting and mismanaging a forest such that new trees can no longer be grown. Exceeding the capacity of air and water resources to absorb and disperse pollution so that air and water become unsafe to consume is an example of poor stewardship in the environmental pollution management area. The Christian environmental steward understands that the elements of the environment or environmental systems that he or she may be involved in using or managing are ultimately controlled by God according to his ways and plans. Whether he or she is involved in the use and management of farmland, forestland, parks, natural areas, or air and water resources at a large-scale, the Christian environmental steward realizes that human use and management of the environment and environmental systems which run counter to God’s ways and plans are detrimental to nature and ultimately to people. There is also a realization that whenever we go our own way rather than following God, he is grieved by our actions. To carry out his or her responsibilities, the Christian environmental steward attempts to learn as much as he or she can about the God-intended order and purpose of the environment. This effort includes learning about individual elements of the environment, and how these elements function within environmental systems created and sustained by God. Also important is understanding the specific benefits or services provided to people by the environment and environmental systems (e.g., ecosystem services) and how people value these services. The Christian environmental steward puts this knowledge into practice by doing his or her best to use and manage the environment within the boundaries of God’s ways and plans. An important, overarching implication of the Principle of Universal Corruption and Redemption for the practice of Christian environmental stewardship is that everyone who is involved in the study, use and management of nature is corrupted by sin. Dealing with the effects of sin in our own lives and the lives of others represents a major challenge to Christians involved in the use and care of nature through education, administration or direct management in the field. To effectively meet this challenge, the Christian environmental steward applies biblical values and guidance to manage both the environment and people in a positive manner. The Christian environmental steward also acknowledges that God will redeem both people and nature in the new heaven and earth. Knowing that God intends one day to redeem nature should motivate Christians to view and act differently towards the environment. Christians should also be involved as much as possible in the process of redeeming nature here and now on earth as an expression of our own redemption and salvation and the “living out” of our faith (Phil. 2:12-13; Jas. 2:14-25). In the case of a Christian forester or ecologist, for example, being involved in the restoration of a healthy forest ecosystem is consistent with and honors God’s ultimate plan for redeeming nature. In contrast, being responsible for widespread and complete destruction of a particular forest ecosystem does not seem consistent with nor does it honor God’s plan for redeeming nature. We are faced in the world today with many natural resource and environmental issues and problems. There are issues and problems related to managing the environment and natural resources provided by the environment to provide food for eating, paper for writing, lumber for construction, and areas for people to participate in outdoor recreation and experience aesthetic enjoyment of nature. There are issues and problems related to protecting the environment from many sources of degradation or damage by people. If the environment is degraded or damaged by people (or even by itself), there are issues and problems related to how to go about repairing or mitigating the environmental damage. 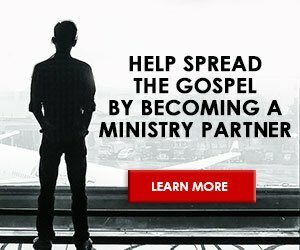 Christians are in a unique position to offer thoughtful solutions to the environmental and natural resource problems and issues we face in the world today. As mentioned at the beginning of this article, there is growing recognition on the part of people from a variety of professional and personal backgrounds that effective, long-term solutions to natural resource and environmental problems and issues requires an appropriate moral basis for action. God’s Word found in the Holy Bible provides this moral basis in the form of a Christian environmental ethic that results in responsible and caring stewardship of all of God’s creation. The principles of Creation Value, Sustained Order and Purpose, and Universal Corruption and Redemption provide the foundation of a Christian environmental ethic. To practice effective Christian environmental stewardship, we must work on increasing our knowledge of these principles from biblical, scientific and practical policy and management perspectives. But stale, book-knowledge of these principles is not enough to get the job done. In Romans 12, the Apostle Paul says, “Do not conform any longer to the pattern of this world, but be transformed by the renewing of your mind. Then you will be able to test and approve what God’s will is—his good, pleasing and perfect will” (Rom. 12:2). This passage implies that before we can effectively manage or take care of the environment according to God’s ways and plans, we must renew our minds. This renewal process first requires that we become new persons through a personal relationship with Jesus Christ as Savior and Lord. As it is said in the Scriptures, “if anyone is in Christ, he is a new creation; the old has gone, the new has come!” (2 Cor. 5:17). Once we have become a new creation or person in Christ, our minds and thinking can and are renewed in many areas of our lives. In the area of environmental stewardship, a deep, personal understanding of the way God loves and sustains all of his creation gives us a new and proper perspective of the temporal and eternal value and purposes of the environment. This understanding, when taken to heart, transforms how we view and carry out our God-given role as Christian environmental stewards or caretakers. Christian environmental stewards may be farmers, foresters, or anglers who manage and harvest the land and waters of the earth in a productive and sustainable manner. They may be professional biologists, botanists, ecologists or other environmental scientists who study the environment and develop scientific solutions to problems and challenges related to managing specific parts of the environment or entire environmental systems. They may be toxicologists or other human health specialists who study the effects of environmental pollutants on people in order to develop waste management and pollution control strategies that protect and maintain our health and quality of life. Christian environmental stewards may be professional economists, sociologists, or political scientists who study economic and social systems in order to help solve problems and challenges related to people’s use of natural resources and impacts on the environment. They may also be philosophers or theologians who help us to understand the proper biblical perspectives on the worth and purposes of people and nature. Professors at colleges and universities and teachers at secondary schools can also be Christian environmental stewards through teaching, research and public service activities that provide needed information and equip others to meet environmental and natural resource problems and challenges in a Christian manner which honors how God wants us to respect and care for his creation. The above listing of possible professions of Christian environmental stewards is meant to be illustrative, not exhaustive. The fact of the matter is that every Christian can and should be a Christian environmental steward or caretaker no matter what his or her vocation or position in life happens to be. What characteristics distinguish the Christian environmental steward from others involved in the caring for and managing the environment? The proper model for environmental caretaking from a biblical perspective is stewardship (Gen. 2; Luke 12:16). The Christian environmental steward first recognizes that nature, like everything else in heaven and earth, was created by God, belongs to God, and is valued by God for itself. The Christian environmental steward helps to utilize and manage the environment as God intended in the service of both God and people. When using and managing the environment, the Christian environmental steward recognizes that he or she has a responsibility to manage or take care of the environment in a way that is not wasteful or destructive of the original functions of the environment designed and sustained by the triune God – Father, Son and Holy Spirit. The Christian environmental steward respects plants, animals and other elements of the environment in their created order out of respect for God their creator. The Christian environmental steward also respects and values nature because he or she knows that both people and nature will share in redemption and renewal in the new eternal heaven and earth. Respecting and valuing nature never makes nature the object of a Christian environmental steward’s worship. Rather, credit and honor and worship always goes to the Creator of nature and not nature itself in the same way that credit and honor for a magnificent piece of artwork does not go to the artwork itself, but to the artist who created it. John C. Bergstrom is Richard B. Russell, Jr. Distinguished Professor of Public Policy at the University of Georgia in Athens, Georgia. He teaches and conducts research related to natural resource, environmental and agricultural issues and policy. As a Christian professor, he is interested in the integration of Biblical teaching on stewardship and our responsibilities as stewards and managers of God’s creation. 1. All Scripture references in the article are taken from the New International Version (NIV), The Study Bible: New International Version. Grand Rapids, MI: Zondervan Bible Publishers, 1985. 2. See Daly, Herman E. “The Steady-State Economy: Toward a Political Economy of Biophysical Equilibrium and Moral Growth,” in Herman E. Daly and Kenneth N. Townsend, eds., Valuing the Earth: Economics, Ecology, Ethics (Cambridge, MA: The MIT Press, 1993); Paul H. Santmire, The Travail of Nature (Philadelphia, PA: Fortress Press, 1985); Francis A. Schaeffer, Pollution and the Death of Man: The Christian View of Ecology (Wheaton, IL: Tyndale House Publishers, 1970 [reprinted by Crossway Books, Wheaton, IL; 1992]); Ruth Goring Stewart, Environmental Stewardship. Global Issues Bible Studies (Downers Grove, IL: InterVarsity Press, 1990); Fred VanDyke, David C. Mahan, Joseph K. Sheldon, and Raymond H. Brand, Redeeming Creation: The Biblical Basis for Environmental Stewardship (Downers Grove, IL: InterVarsity Press, 1996); Lynn White, Jr., “The Historical Roots of Our Ecological Crisis,” Science 155 (March, 1967):1203-1207. 3. See Schaeffer, Pollution and the Death of Man; and VanDyke, et al, Redeeming Creation. 4. Christopher B. Barrett and John C. Bergstrom. “The Economics of God’s Creation,” Bulletin of the Association of Christian Economists 31 (Spring, 1998):4-23. 5. Brown, Colin. Philosophy and the Christian Faith (Downers Grove, IL: InterVarsity Press, 1968). 6. The elements of Gnostic thought are seen in the Apostle John’s writing in 1 John. The application in 1 John is primarily a person’s physical body, but the Gnostic precepts can be extended to the entire physical world. 7. Schaeffer, Pollution and the Death of Man. 8. See Donald VanDeVeer and Christine Pierce, The Environmental Ethics and Policy Book (Belmont, CA: Wadsworth Publishing Company, 1998); and John Seed, Joanna Macy, Pat Fleming, and Arne Ness, Thinking Like a Mountain: Toward a Council of All Beings (Philadelphia, PA: New Society Publishers, 1988). 9. Kevin L. Burrell, “The Ethics of Environmentalism,” Faith and Practice 2 (Fall, 1996): 16-24; and Tony Campolo, How to Rescue Earth without Worshiping Nature (Nashville, TN: Thomas Nelson, 1992). 10. Schaeffer, Pollution and the Death of Man: The Christian View of Ecology. 12. See Schaeffer, Pollution and the Death of Man; and VanDyke, et al, Redeeming Creation. 13. Calvin B. DeWitt, “Seven Degradations of Creation,” Perspectives (February, 1989):4-8.